I refer to your email to the PTC Chairman on 29 December 2011. He has read your email as well as your previous petition to the PTC in 2009. He is aware of the issues raised and he has requested me to respond on his behalf. We thank you for bringing to our attention that notwithstanding the various forms of transport assistance already available, there are still people with disabilities who do not benefit from the existing concession or assistance schemes. Further to our earlier reply in December 2009, we would like to share that concessions on public transport are cross-subsidised by other full fare-paying commuters. That is why the public transport operators have been judicious in expanding the pool of concession groups. Please be assured that the public transport operators are fully aware of requests for concession by the disabled, including your petition in 2009 which we had shared with them. 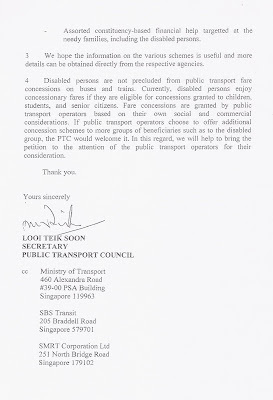 Going forward, the PTC will continue to encourage the public transport operators to review their policy on public transport concessions for various groups including the disabled, and work with them progressively to meet the various concession requests in a balanced manner. I refer to this report here (https://www.facebook.com/notes/lim-kun-yun-edison/reflection-on-meeting-with-ptc-chairman-mr-gerard-on-the-issue-of-polytechnic-tr/10150496848434074) which states that you have met with member of Young PAP campaigning for parity in public transportation for polytechnic students. The article states that 2012 will be the year in which the formula for fare adjustment for public transportation will be re-looked and so next year would be a good year to 'push for fare revisions for polytechnic students'. We are gladdened that you have chosen to meet with the young Party members to personally hear their grouses about the unfair public transport fare. In September 2009, we requested to meet the then-Transport Minister Raymond Lim to deliver a petition signed by 377 people who are mostly from the disabled community (but also includes some caregivers and a few sympathisers to our cause). A staff from the Ministry responded to us that "public transport fare concessions are granted by the public transport operators based on their commercial and social considerations. They will decide which group of commuters to give concessionary travel to. Therefore, we would suggest you contact the public transport operators directly to present your petition. The two operators can then work together to look at your petition accordingly." We have written in to the Public Transport Council the past and you had responded that there are schemes like the National Council of Social Services administered ‘LTA Cares Fund’, Handicap Welfare Association’s ‘Dial-a-Cab’ scheme, LTA administered ‘Scheme for waiver of ARF’ and other assorted constituency-based financial help schemes to defray the transportation costs of people with disabilities. While we appreciate these help schemes, they do not go the distance in helping us, the more vulnerable in society, live more useful, active and engaged lives. Although the people with disabilities are not precluded from the existing concession granted to children, students and senior citizens, many of us do not fall within these groups of people who are granted such concessions. Most people with disabilities who are employed earn a meager amount and usually spend more than a third of our income on transportation. The burden of transportation for those that are unemployable is even more a cause for concern. The article states that after meeting with them you mentioned, "I would rather focus on getting the Poly Fare lower than any other things next year (2012)". This underscores the reason why we wanted to meet with the Transport Minister in 2009. We felt that nothing can convince someone of a cause better than a face-to-face meeting. In view of the fact that the formula for fare adjustment for public transportation will be re-looked next year, my friends and I write this email to request a meeting with your good-self so that you may hear and understand why we are asking for parity in public transportation; that the same level of transport subsidy that is given to our senior citizens be extended to us as well. This is the norm all over the world. We hope to convince you (if we get to meet you in person) why parity in public transportation for people with disabilities is important; so that we may live our lives with dignity. CAN! members Rahamatullah and Shamsiah garlanded Ms Sylvia Lim for speaking up for the people who are disabled twice in Parliament. CAN! hopes that the Minister for Transport will not be "very slow in stipulating (to operators) how best to run the concession policy", in the new Parliament. And that the new government will do their part in helping the people with disability get the dignity they deserve. CAN! 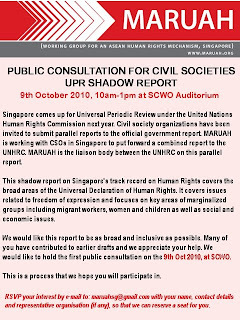 and Deaf and Hard-of-Hearing Foundation made a joint-submission to the United Nations on using the rights-based approach when dealing with people with disability, as part of the Universal Periodic Review (UPR) process that will review Singapore’s human rights record. The submission can downloaded via the link HERE. CAN! 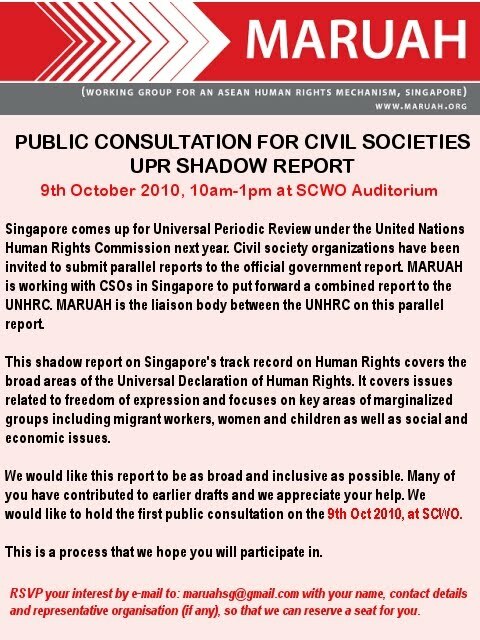 representatives Reena and Rahmatullah participated in MARUAH's public consultation exercise for civil societies UPR shadow report. 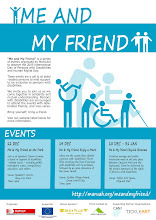 We decided to put up a joint report on 'People with Disabilities' with MARUAH, as we felt that although the government of Singapore has made good effort to meet some of the needs of the people with disability, these efforts are largely rendered from the platform of charity and not from the platform of rights. 3. Setting up a centre for people with disabilities, which will coordinate resources and support with the government. This was a speech in Parliament on 11 March 2010 by NCMP, Sylvia Lim,during the Committee of Supply debate, on the budget for the Ministry of Transport. Disabled persons face challenges fitting into society for work, recreation and social interaction. Travel is a necessary step towards integration, to work, to socialise and to be consumers.There are currently no public transport concessions for the disabled.The disabled here have low earning capacity. Many do not work; those who do, earn a few hundred dollars per month, spending up to a third on travel expenses.The government has often said that we should build an inclusive society. It therefore should not take a back seat on this issue.Other governments are proactive. In the UK, disabled persons qualify for a special “Railcard” which entitles them to travel throughout the UK at one-third off from the normal fare. In addition, disabled persons in London can travel off-peak for free on buses, the Underground and trains.The government cannot wash its hands off the matter by saying that the public transport system is operated commercially and it is up to the public transport operators (PTOs) to decide. 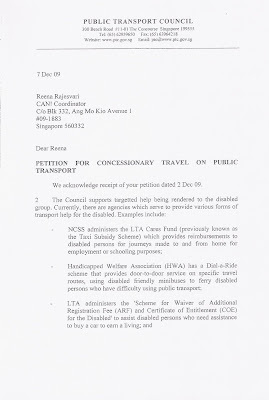 The disabled have no bargaining power against the big companies.For instance, the Land Transport Authority, as regulator, can make it a licensing condition that the PTOs recognize disabled passengers for concession travel.According to a 2001 MOH survey, less than 2 per cent of Singaporean adults below 60 have some sort of disability. Is the number of disabled too much for the PTOs? The PTO’s operations are reaping profits of tens of millions of dollars annually and this is part of their corporate social responsibility. Disabled persons face challenges fitting into society for work, recreation and social interaction. Travel is a necessary step towards integration, to work, to socialise and to be consumers. There are currently no public transport concessions for the disabled. The disabled here have low earning capacity. Many do not work; those who do, earn a few hundred dollars per month, spending up to a third on travel expenses. The government has often said that we should build an inclusive society. It therefore should not take a back seat on this issue. Other governments are proactive. In the UK, disabled persons qualify for a special “Railcard” which entitles them to travel throughout the UK at one-third off from the normal fare. In addition, disabled persons in London can travel off-peak for free on buses, the Underground and trains. The government cannot wash its hands off the matter by saying that the public transport system is operated commercially and it is up to the public transport operators (PTOs) to decide. The disabled have no bargaining power against the big companies. For instance, the Land Transport Authority, as regulator, can make it a licensing condition that the PTOs recognize disabled passengers for concession travel. According to a 2001 MOH survey, less than 2 per cent of Singaporean adults below 60 have some sort of disability. Is the number of disabled too much for the PTOs? The PTO’s operations are reaping profits of tens of millions of dollars annually and this is part of their corporate social responsibility. Mr Teo reiterated the Government’s non-intervention stand; it will “strongly encourage” public transport operators to consider requests from the disabled and elderly. Help is available to the needy through schemes such as Workfare and ComCare, said Mr Teo.